It isn’t very often that I have difficulty classifying a game. Usually they fit nicely into certain categories. Card games, board games, abstracts, dexterity… There are dozens of well-defined descriptions we use to describe the expected game play. But there’s one area of gaming that is sorely under-represented on SahmReviews – one that we’ll call pure “Logic Games”. If you’ve ever played the classic Mastermind you’ll have a good idea of what I’m referring to. 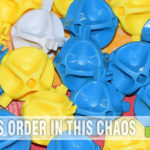 One player sets up a secret combination of colored pegs and the other has to use trial, error and logic to determine the correct colors and pattern in a certain number of tries. Yes it uses a board, but the game play is pure logic. I guess you could also apply this definition to Battleship. This time each player is creating their own “pattern” of naval warships on a grid and you must try to sink theirs before they discover yours. Both of these games are for only two players and this type of head-to-head competition is typical of logic games. And of course there are plenty of single player puzzle games from ThinkFun and others. These require an ever-increasing logic ability to solve all of the puzzle variations included in one box. But finding a logic game for multiple players turned out to be quite the challenge in itself. Fortunately we came across Zendo by Looney Labs. Zendo was originally published in 2003 and has recently been updated, improved and reissued in 2017. 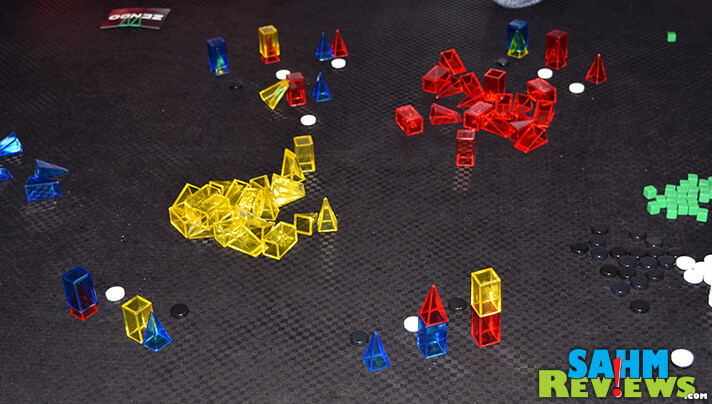 The game play is still the same as the original but now includes additional shapes and expanded rules. And it supports up to six players! In the box you’ll find 27 each of translucent pyramids, wedges and blocks in three different colors along with an equal number of black disks, white disks and green cubes. Forty challenge cards, two clips and two instruction booklets round out the contents. Zendo is played as a one vs. many game of inductive logic. During each round one person will act as a moderator who selects a card and marks it with the provided clips. This sets the “secret rule” for the round and the moderator then constructs two structures using one or more pieces for each. One of the structures will conform to the secret rule, while the other will not. The conforming creation will be marked with a white token while the non-conforming one will be marked with a black token. 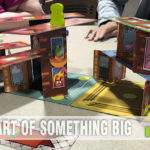 The rest of the players will then take turns each building a structure of their own and then inquiring as to its accuracy of meeting the secret rule criteria. After completing their structure they will then choose either “Tell” or “Quiz”. 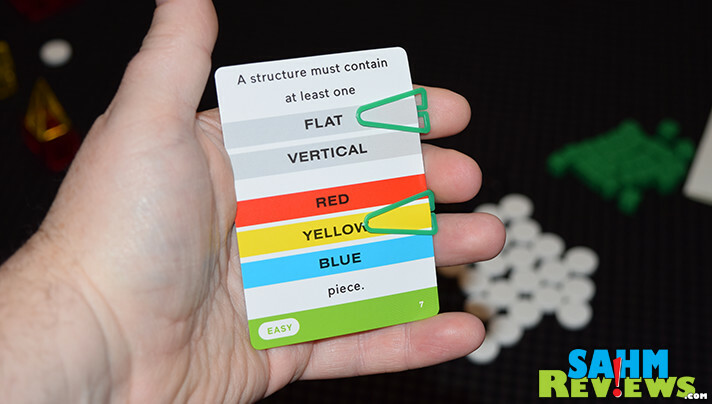 If “Tell” is chosen, the moderator simply marks the structure with a white or black token signifying whether or not their structure conforms. Choosing “Quiz” allows other players to guess on whether or not your structure conforms. Each player (including the builder) selects one of their answering tokens (black or white) and hides it in their hand. All guesses are revealed together and the moderator will mark the structure with the correct answer. Anyone who guessed correctly receives a Guessing Token, one of the green cubes. So what are you trying to discern about the structures? 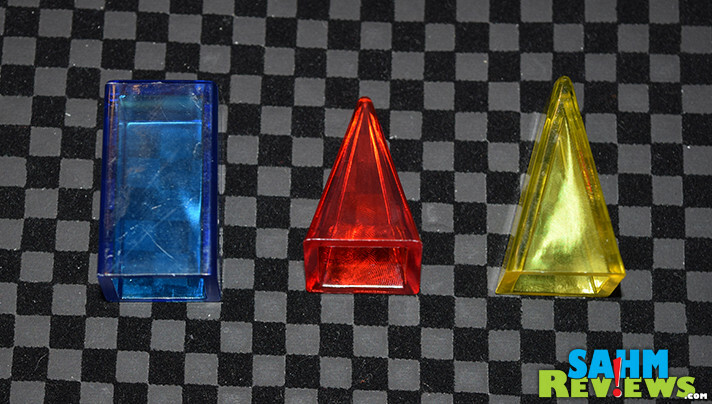 The secret rule might be something like “A structure must contain exactly one pyramid” or “A structure must contain all three colors”. These are two examples of the easier rules and Zendo includes cards for varying levels of expertise. Some of the more difficult rules to discern might be “A structure must contain more red than blue” or “A structure must contain at least one block on top of a blue”. 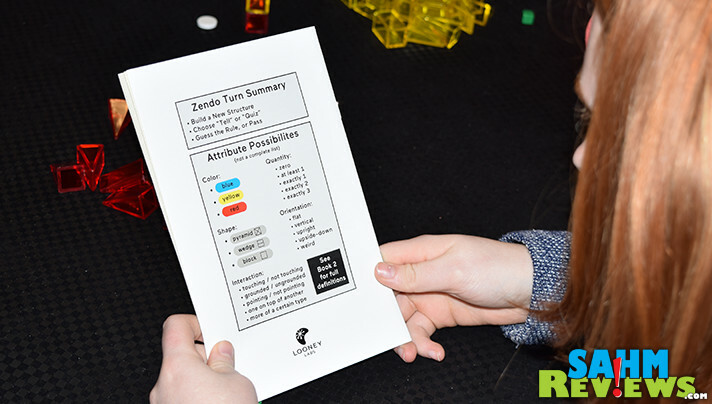 Zendo includes forty different rule challenges, each of which are customized by the moderator’s selections which are marked with the clips. Some cards have decoy areas, so while other players still see you marking two criteria, in reality you are only choosing one! In order to win at Zendo you must make an official guess. And to do so you must pay a guessing token. It is then up to the moderator to disprove your guess by either building a structure that follows the special rule but also disproves your guess or one that doesn’t follow the rule but matches your guess. 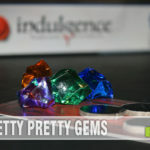 You may guess as many times as you like on your turn, but must supply an additional guessing token for each guess. If you have not earned a token during the Quiz portion of the game, you may not make a guess. The role of moderator is best handled by someone experienced with Zendo and with an attention to detail. It is their responsibility to make sure all buildings are correctly marked with answer tokens. A player can win simply by guessing a rule that a moderator is unable to disprove, even if it doesn’t accurately match the secret rule. So your ability to act as the judge will affect your overall success as a moderator! 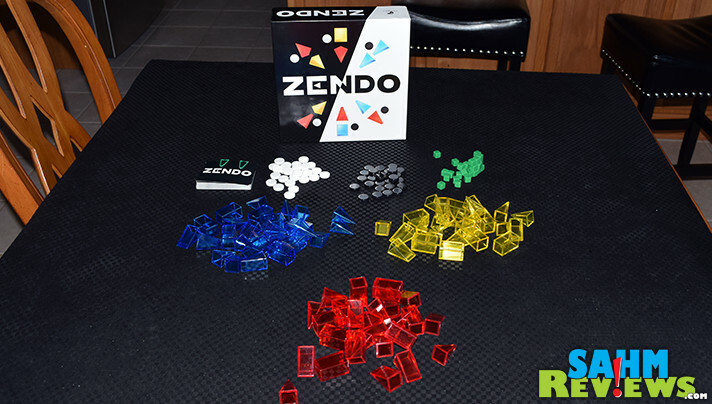 Zendo also includes a secondary rulebook that allows fans to dive deeper into a game or become more adept at the role of moderator. This pamplet features great advice for new players, tips for moderators on how to ease new players into complex concepts and what to do if a game goes too long. Mistakes will happen during any game and this is also covered by these additional suggestions. 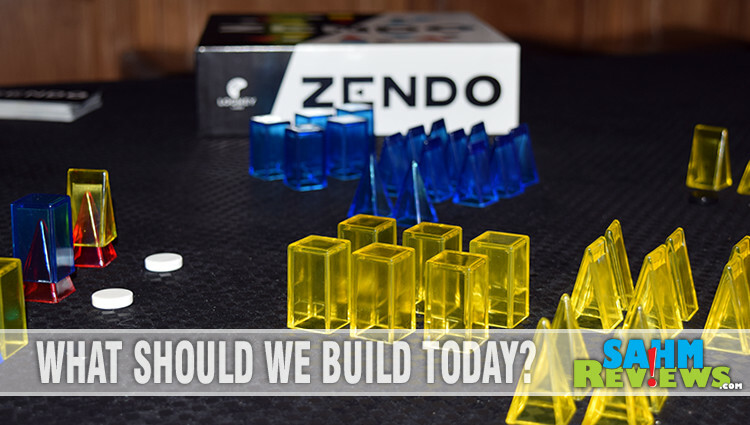 We’re always asked to recommend games that teach critical thinking, and we feel comfortable giving an extremely high recommendation to Zendo for exactly this purpose. 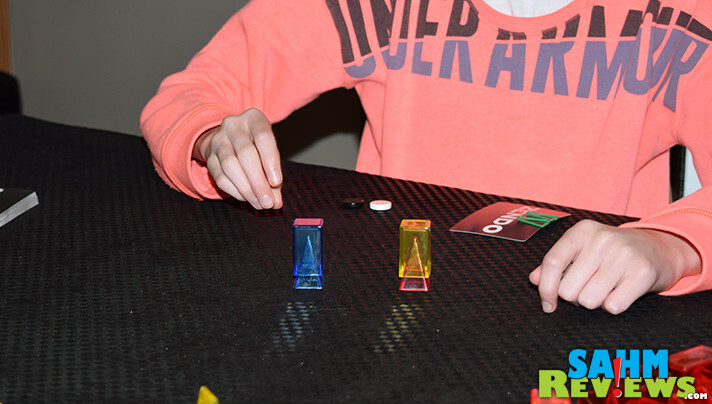 While the box has an age recommendation of 12+, when moderated by a parent and sticking to the easier challenge cards, there is no reason someone as young as seven or eight couldn’t excel at Zendo as a player. 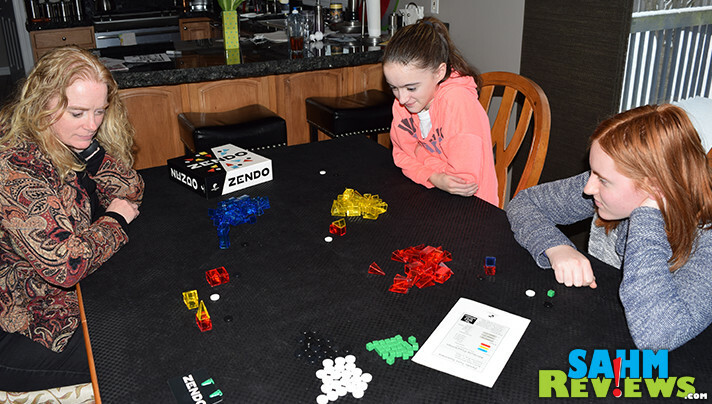 Mastermind was introduced to our family when I was in third or fourth grade and I would consider Zendo to be of similar difficulty. Your copy of Zendo is on Amazon for under $40 shipped or can be found at your local game store. 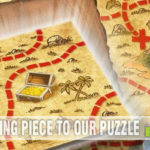 You’re probably familiar with Looney Labs for their ever-popular line of Fluxx card games, but did you know they have a number of other board games on their website? Check them out on Facebook and Twitter where they regularly offer goodies for loyal followers, especially around the holiday season. Do you have a favorite logic game or puzzle? New Games From Calliope? We Got ‘Em! I haven’t heard of Zendo until now. The price is certainly right. I’m always looking for a fun new game to play with the family! We love a good challenge and I think this one would be perfect to lay with my older boys! This would be great in a math classroom! This looks like perfect game for my 16-year old granddaughter and her friends!